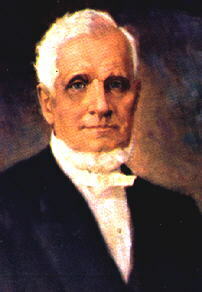 Tomorrow (November 1, 2008) marks the 200th anniversary of the birth of Mormonism’s third prophet and president, John Taylor. Taylor became an LDS apostle in 1838, then became the President of the LDS Church in 1880. Having married 16 women (8 of them in the year 1846) and fathered 35 children, John Taylor died of congestive heart failure on July 25, 1887 (see Richard S. Van Wagoner and Steven C. Walker,A Book of Mormons). John Taylor is well known for the comfort he provided Joseph Smith during Smith’s last hours in Carthage Jail when he twice sang, at the Prophet’s request, “A Poor Wayfaring Man of Grief.” Perhaps lesser known are some of John Taylor’s teachings. In honor of his 200th birthday, a few notable teachings from John Taylor are provided below. This is not ordinarily the topic matter I post in, but perhaps I’ll offer some thoughts. There are many words that come to my mind when considering this individual. Deceived … lost … social revolutionary. Mr. Taylor was a usurper to the throne.